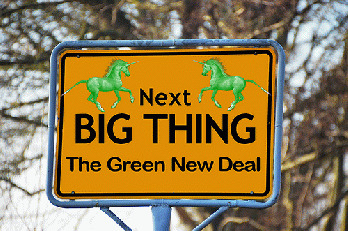 On February 7, US Senator Ed Markey (D-MA) and US Representative Alexandria Ocasio-Cortez (D-NY) released the text of a joint resolution calling for a "Green New Deal." Fine, said Senate Majority Leader Mitch McConnell (R-KY). Let's vote on it in the Senate. No, no, said Markey. Absent a long organizational campaign and a detailed debate, voting on it would essentially be "sabotage." Ocasio-Cortez decried the vote as a "bluff." Senate Minority Leader Chuck Schumer (D-NY) called it a "stunt." In a sense, they're right. But for at least six Senate Democrats, the "stunt" is also a "rout." Five of those six US Senators are Cory Booker (D-NJ), Kirsten Gillibrand (D-NY), Kamala Harris (D-CA), Bernie Sanders (I-VT,), and Elizabeth Warren (D-MA), all of them declared candidates for the Democratic Party's 2020 presidential nomination and all of them declared supporters of the Green New Deal. The sixth is Amy Klobuchar (D-MN), also seeking that nomination, who's been lukewarm on the whole idea, calling it "aspirational" and saying she'd likely oppose specific parts of it. They've all previously and publicly expressed their opinions on the Green New Deal. But when push came to shove in the US Senate on March 26, they all voted "present" instead of casting their votes one way or the other. It's fairly easy to change your mind, and hopefully easy to convincingly explain why. People change their minds all the time. No biggie. On the other hand, it's impossible to change a recorded vote in the US Senate. Such a vote is a significant and consequential act and reversing yourself is much harder to explain. Ask former US Senator John Kerry (D-MA) how being for the Iraq war before he was against it played for him on the presidential campaign trail. Booker, Gillibrand, Harris, Sanders, Warren and Klobuchar don't want their positions on the Green New Deal indelibly recorded as votes in the US Senate. They want freedom to triangulate their positions toward the desires of Democratic primary voters over the next year, and general election voters over the next year-and-a-half, with minimal explanation required. People in hell want ice water, too. 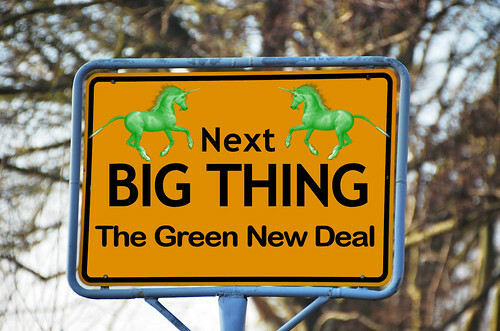 Whatever one thinks about the Green New Deal, it's already become a movement-defining manifesto for the Democratic Party. The party, and its presidential candidates, are going to have to decide -- and forthrightly declare -- whether they're for it or against it. Instead of strapping on the courage of their convictions one way or the other, Booker, Gillibrand, Harris, Sanders, Warren, and Klobuchar ran for cover.